Hey Guys! You've landed on Annapolis USA Did you know the factory ships out free all over America twice everyday. See USA Home Page here. 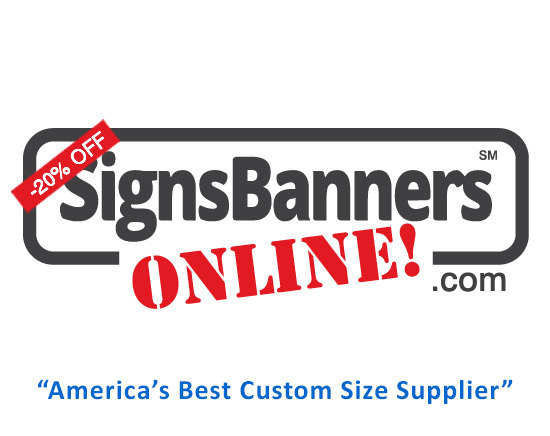 All over America Signs Banners Online are supply finished printed cut sewn grommetted & custom print barrier banners in large quantities for event managers. You can too. Printed event fence screen panels like this are very cheap to produce and offer the client maximum exposure and make signs better. Available ALL STATES, it's easy to order online and manage it your self. From a few panel covers to full district throughputs your Annapolis event company can sell space and promote your event branding. Material used can be opaque, sheen, or gloss, mesh or solid. Ranging from concept to print, as an advertising and management company event signage applications present excellent branding opportunities in a community where your market is standing. Range sizes from single panel cover to 100's. SBO have the resources to print a city block or marathon. Portable re-usable, easy to store. Attach to picketed steel barricades or plastic mould systems. Zip ties, elastic bungee, cable, wire. Repetitive logo scenes or FULL PHOTO Print, blend logos (modern print techniques). 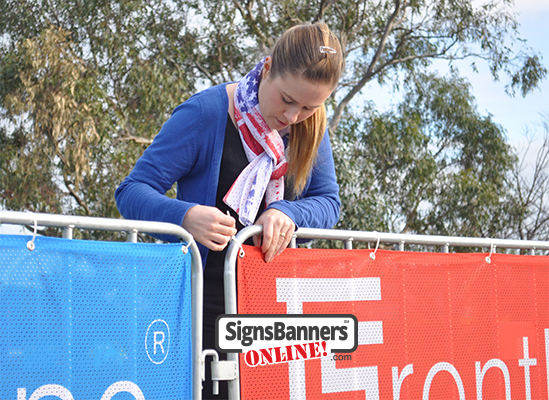 Printed event covers and signs can be stored and re-used. Concealment Screens and equipment 'hide-a-ways' such as large speaker covers. 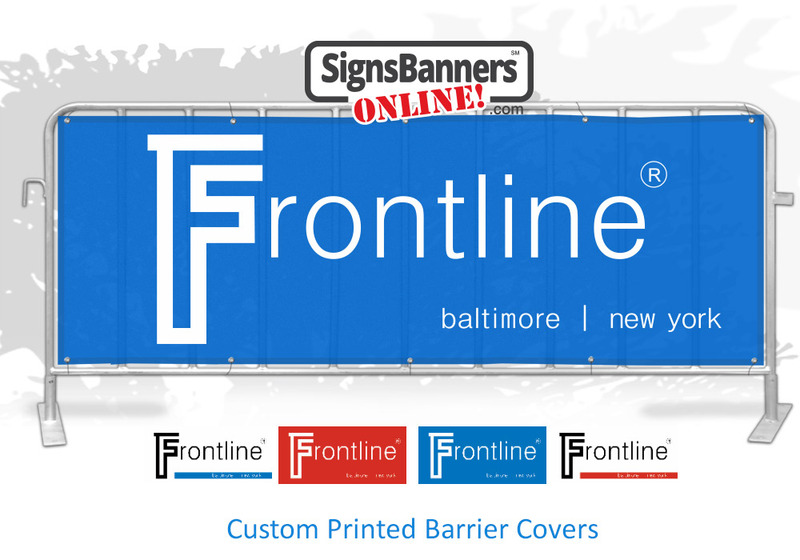 Unlimited creativity, design and logo application make these community and pedestrian walkway covers the best. 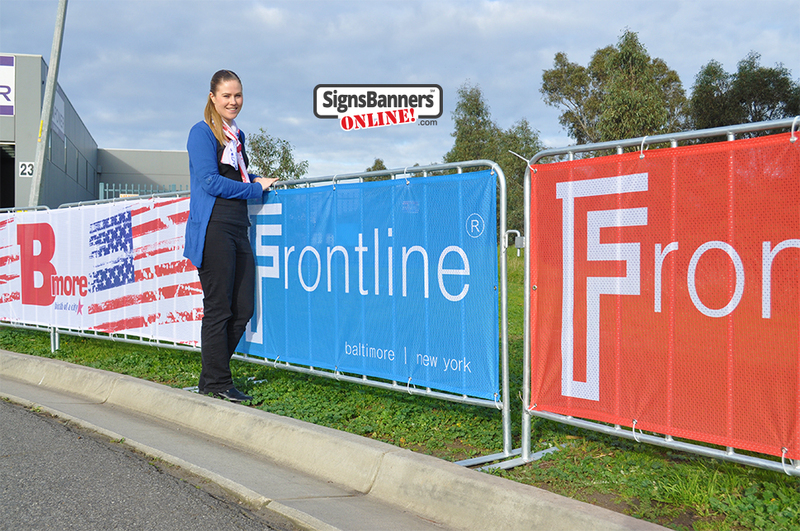 The image shows a young lady standing outside next to the event sign banners on a series of hire rent portable fence crowd barricade steel frames that are upright. Supplying some of America's largest event companies. 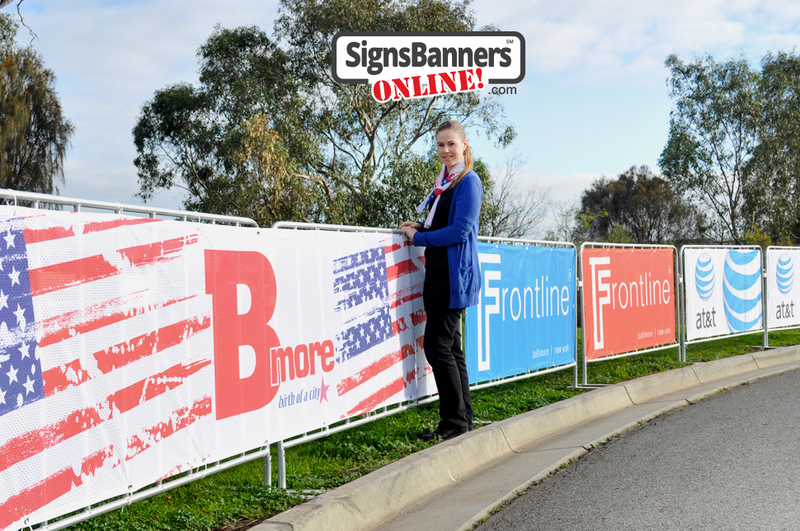 SBO have the print resources to provide major events throughout USA and indeed world wide. As used by many agencies and management event companies. Many companies prefer a non-shine facing when televised. This page shows the outcomes from initial customer concept through to printing, sewing and installation outside. Total volume customer received maximum discount based on pre-planned event timelines and scheduled shipping time outs. 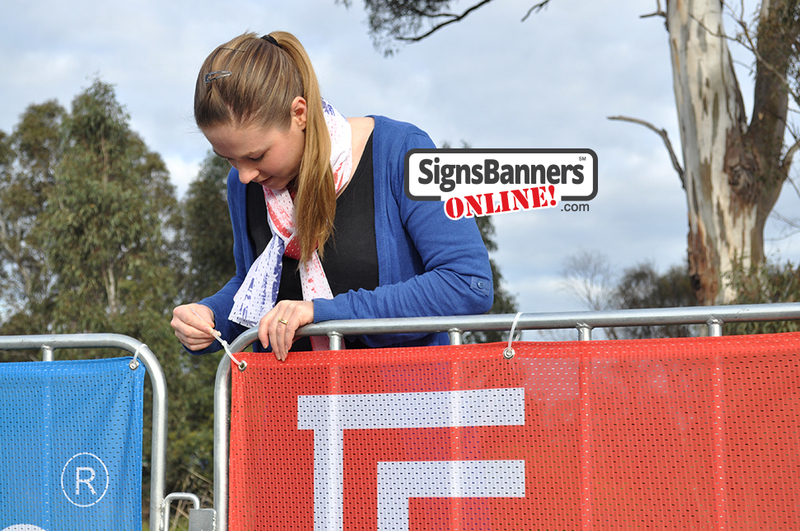 This photo shows the outstanding quality SBO offer using the famous DuraSports Mesh for the printed banner sign. Less show-through, higher quality print, crisp imagery and creative texts are all achieved. 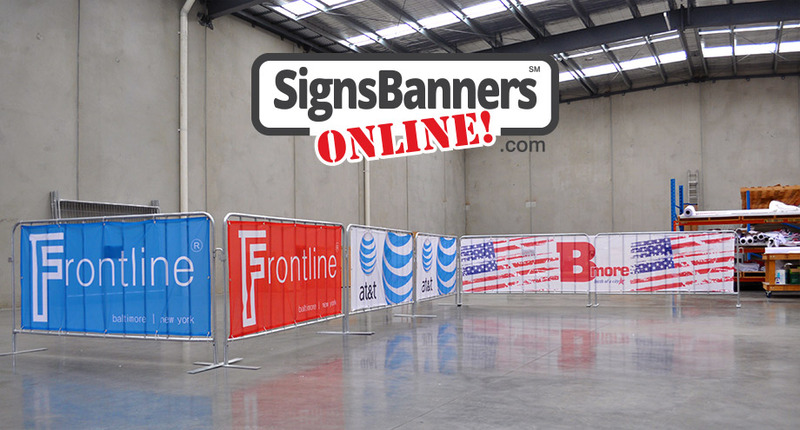 Signs Banners Online supply many of America's leading sporting agencies and key note events such as major events, spectactulars and large sporting bodies.